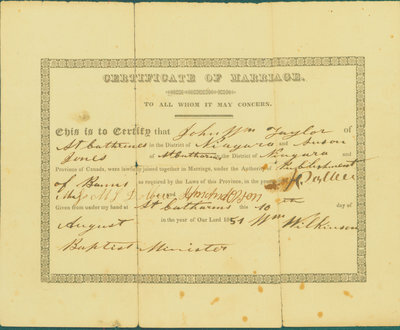 A certificate of marriage, dated August 10, 1851, for John William Taylor, of St. Catharines, to Susan Jones, also of St. Catharines. The certificate is signed by a William Wilkinson, Baptist Minister. This marriage certificate was in the possession of Rick Bell, of St. Catharines, Ontario. Rick Bell's mother, Iris Sloman Bell, had this certificate among other family memorabilia in the attic of her St. Catharines home. Relatives of the Bell - Sloman families were former Black slaves from the United States who later settled in the London and St. Catharines areas of southern Ontario.